The simplicity of Line Birds by Djinnworks is really the key to its success. Like so many popular iOS games before it, Line Birds takes a basic concept and turns it into an addicting endeavor. The object of the game is to guide your bird through obstacles and get as far as you can, making it essentially a leaderboard chase for you and your friends. Yet while Line Birds is a solid enough concept, it’s a shame it relies on aping other popular games in its style and presentation. Lifting the character design of Angry Birds and employing the grid-paper background of Doodle Jump is a rather cheap way of getting attention when the simplistic gameplay is strong enough to hold its own. 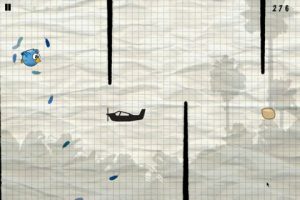 Perhaps you’ve played a game like Line Birds before; probably a Flash-powered browser game starring a helicoptier, rather than a bird. 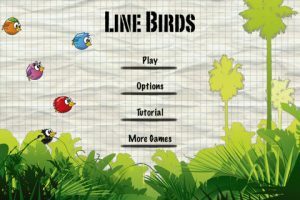 In Line Birds, you guide your bird through an obstacle course by holding down your finger on the screen to make it fly. Letting go causes him to fall. 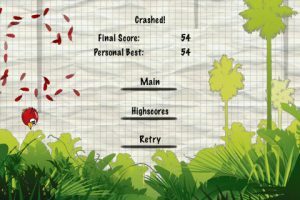 Hitting either the obstacles (simple lines drawn on the screen) or the top or bottom of the screen causes an immediate game over. However, you are able to graze the boundaries, as long as you don’t crash into them with too much force. 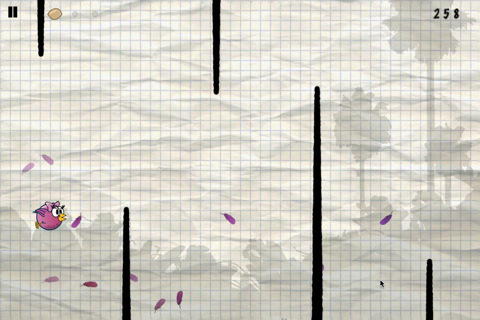 Seeds are scattered throughout the course, and collecting three seeds will allow your bird to use a special ability. As you play the game, you’ll begin to unlock different birds, each with their own special abilities, such as allowing your bird to hover, rather than simply drop off when you release your finger. There are a few different difficulty levels in Line Birds, and the challenge ramps up quite heavily between them. The game is also padded with different objectives (Fly 50,000 meters, get a special bird) and Game Center achievements. 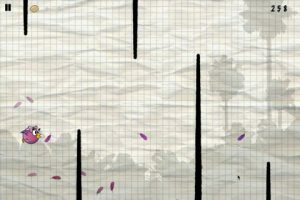 But, again, Line Birds is an extremely simple game that focuses more on repeated attempts to improve your distance than it does on depth of gameplay and options. I’d like to again make mention of the presentation of Line Birds. The game essentially looks like a horizontal Doodle Jump starring the Angry Birds. I don’t doubt that this familiarity will entice many App Store users to give the game a try. But a little more originality would have been appreciated. Perhaps a future patch will give new skin and background options. Bottom Line: Line Birds is a clever, yet extremely simple game that will keep gamers coming back to best their score. Line Birds is compatible with iPhone, iPod touch, and iPad. Requires iOS 3.0 or later.